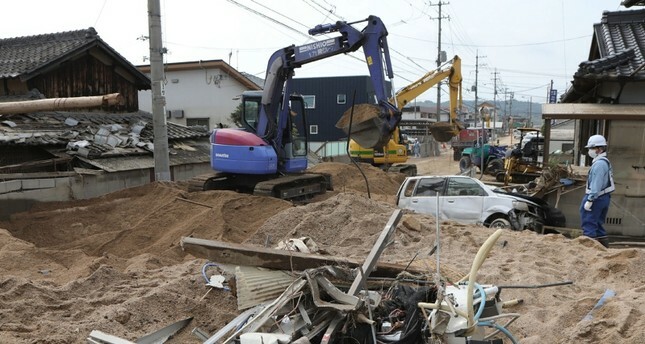 The number of confirmed deaths after recent severe storms across Japan rose above 200 on Thursday, local media reported. Dozens also remain missing, the reports said. The country's west was lashed by heavy storms last week and during much of the weekend, bringing flooding and landslides which led to Japan's worst natural disaster since the 2011 tsunami and earthquake that prompted the Fukushima nuclear accident. With daily temperatures above 30 Celsius (86 Fahrenheit) and high humidity, life in school gymnasiums and other evacuation centers, where families spread out on mats on the floors, began to take a toll. With few portable fans in the evacuation centers, many survivors tried to cool themselves with paper fans. Some teams shoveled dirt into sacks and piled the bags into trucks. Others used diggers and chainsaws to work through landslides and splintered buildings. "It's an undeniable fact that this sort of disaster due to torrential, unprecedented rain is becoming more frequent in recent years," Chief Cabinet Secretary Yoshihide Suga said at a news conference in Tokyo. "Preserving the lives and peaceful existence of our citizens is the government's biggest duty. We recognize that there's a need to look into steps we can take to reduce the damage from disasters like this even a little bit," he added.